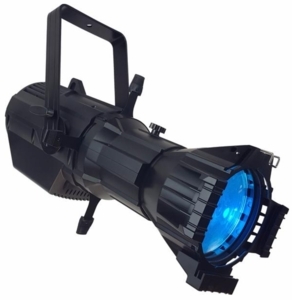 The Aria™ Profile RGBW is an LED ellipsoidal spot fixture that comes equipped with a high-output 180W RGBW 4-in-1 COB LED, which is the driving force behind its brightness and bold color rendering capabilities. And the LED is flicker-free, so it is perfect for video and film. Its brilliant design allows the Aria™ Profile RGBW to create sharp or soft edged beams with manual focus, and it has excellent framing abilities with its (4) blade shutters. These fixtures are also capable of ultra high resolution dimming (4,096 steps per channel), and offer speed controllable built-in programs with smooth fades, sharp color changes, and even has a DMX controllable virtual color wheel for full control and subtle color changes at your fingertips. Users have the ability to change the field angle of the light simply by swapping out the lens tube. The Aria™ Profile RGBW works with all of our currently available lens tubes which include 19°, 26°, 36°, and 50° making it a highly versatile fixture.